The first inductees to the Digital Radio Hall of Fame were presented with their awards at the leading radio industry conference, Drive to Digital, this week. 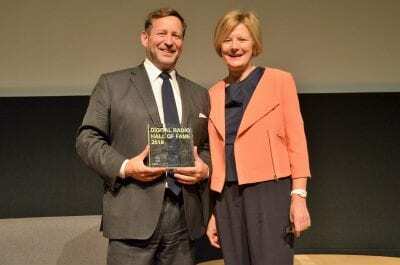 The Rt Hon Ed Vaizey MP and Helen Boaden, former BBC Director of Radio, and Dianne Fuller, Global Sales Director, Roberts Radio, presented the Digital Radio Hall of Fame awards to the nine inductees, all of whom were present. The awards culminated with a surprise presentation to the former Culture Minster with a Special Recognition award for his contribution to digital radio progress during his tenure, which include launching the Digital Radio Action Plan, spearheading the expansion of local DAB coverage, and announcing the second national DAB commercial network. Reinforcing that the establishment of digital radio as the majority of radio listening in the UK has been a collaborative and cross-industry effort, the Digital Radio Hall of Fame recognises individuals from all sectors and areas that have contributed to digital radio progress, with representatives from broadcasters, retailers, manufacturers, automotive, Ofcom and Government.